The Columbian Artists Association promotes the visual arts by fostering an understanding and appreciation of them among members and in the community at large. To achieve this, the association sponsors activities which include exhibitions, demonstrations, lectures, shows/sales, and other appropriate events. The Columbian Artists Association strives for a high standard in the field of art and seeks to benefit the membership in the showing and distribution of art media. 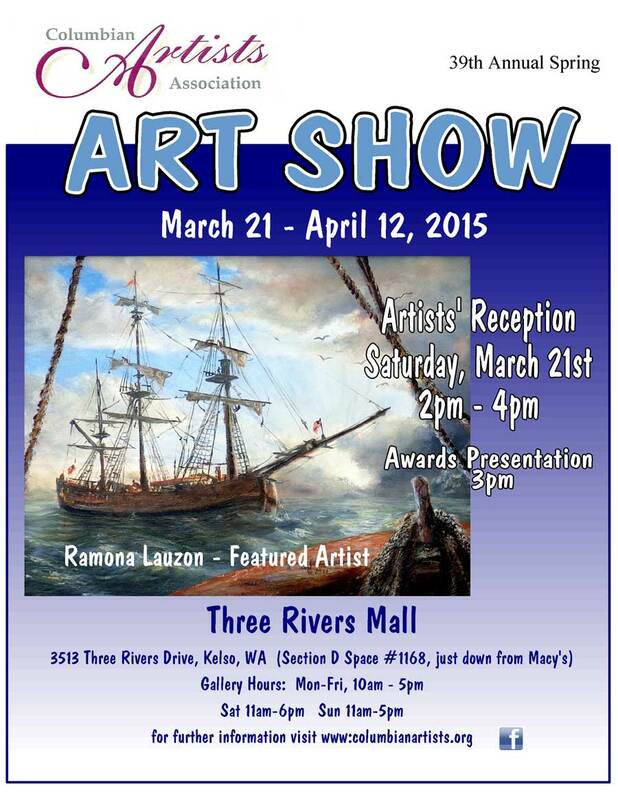 The Columbian Artists Association is a non-profit organization. Join the Columbian Artists Association artists each Friday Afternoon for a painting session from 1:00 to 3:00 at the Broadway Gallery on Commerce Ave. in downtown Longview. Below is a membership form. Submit with your check (made out to Columbian Artists Assoc.) and bring it to the next meeting or mail both to The Columbian Artists Association, P.O. Box 2862, Longview, WA 98632. ©Columbian Artists Assc. 2010-2015 All Photos and Paintings on this Web Site are the property of owners Please do not copy.